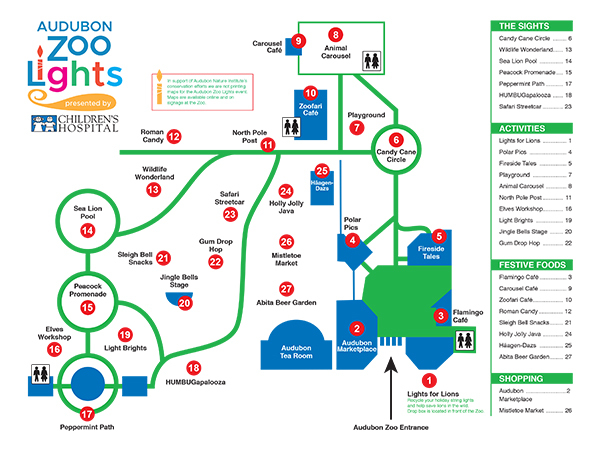 In support of Audubon Nature Institute’s conservation efforts, we are not printing maps for the Audubon Zoo Lights event. Maps are available online and on signs posted throughout the Zoo. Welcoming lights surround the beloved Elephant Fountain. Enchanting sights glow with beautiful animal-themed silk light displays. This iconic Audubon Zoo landmark connects Wildlife Wonderland and Peacock Promenade. Breathtaking lights adorn the canopy of live oaks above the elegant Hygeia Fountain. Candy cane lights and lollipop trees line a charming holiday path through a holiday candy land. Insect-themed light displays perch on rooftops and peek around corners to delight bug-lovers of all ages. A uniquely-New Orleans photo opportunity makes the perfect spot to take a selfie and tag @WWLTV. Recycle your broken holiday string lights and help save lions in the wild. The drop box is located outside the Zoo front gate. Drop in for a children’s story read by a local author. Climb, run, and play in the Zoofari Playground. Take a spin on the famous Endangered Species Carousel (additional charge applies). Send your holiday letters to Santa in a giant North Pole mailbox. Create special messages for Children’s Hospital patients or write a letter to Santa and mail it in the North Pole Post! Create your own light display on a Giant Light Bright board. Enjoy live entertainment presented by IBERIABANK. Watch the colors change as you jump and hop on the light-up pads. There are so many places to take a holiday picture! Grab-and-go foods with outdoor seating. Grab-and-go foods located next to the Carousel. Inside dining with outdoor patio areas. Holiday treats with patio seating. Food court featuring hot dishes, kid-friendly options, desserts, and beverages. Specialty coffee and hot cocoa provided by Petite Rouge Coffee Truck. Craft brews with outdoor seating next to Mistletoe Market. Audubon Nature Institute merchandise, New Orleans and Louisiana-themed items, educational gifts, and books. Gift wrap and shipping are available! Handmade crafts from local artists and unique gift ideas.